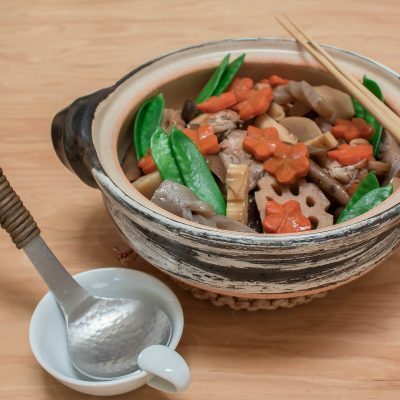 This is a traditional stew called Chikzen-ni, and is often served in a Japanese New Year meal, and one of my favorite New Year dishes since I was a child. 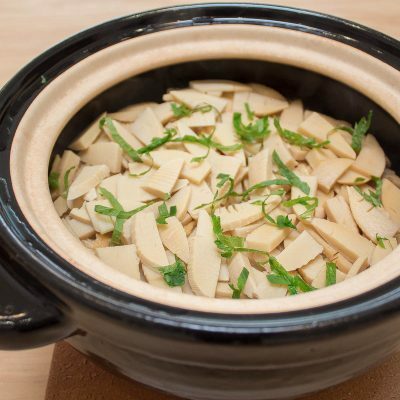 The root vegetables such as burdock, lotus, carrot and sato-imo (taro) are cooked with konnyaku (yam jelly), dry shiitake, and chicken in dashi, and seasoned with soy sauce and black sugar. The flavor is so rich and you can really enjoy the nice earthy flavors. When I serve this dish in the New Year, I cut the lotus and carrot into decorative shapes, but for any regular occasion, that’s not necessary. 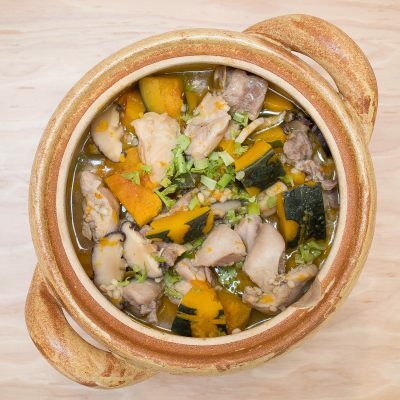 Although I love the flavor of the chicken in Chikuzen-ni, this dish can easily be converted into a vegan dish by simply omit the chicken and use vegan dashi (i.e. kombu and dry shiitake dashi). You can also make it gluten-free by substituting the soy sauce and white tamari with tamari soy sauce. Gobo (burdock) has a natural sweet earthy aroma, and I love the combination of minced gobo with rice for its hearty taste. Daikon leaves add a layer of earthy flavors and texture. If you can’t find daikon leaves, kale can work nicely, too. 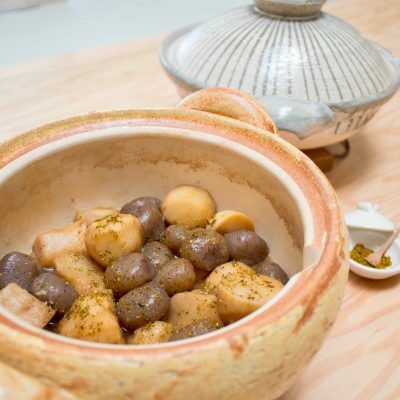 With this rice dish and a bowl of miso soup, it will make a happy donabe meal for me. I love the earthy treat. I like to use a few kinds of mushrooms such as shiitake, king oyster, and shimeji. You can try with your choice of mushrooms. 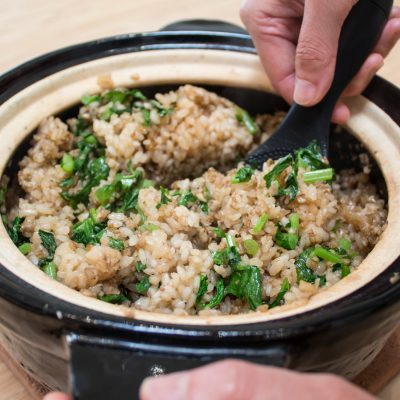 By adding sweet rice, the dish becomes nice and slightly chewy texture, but you can also make it only with short grain rice and it will taste very nice, too. For seasoning, I love white tamari, for its mellow and slightly sweet aroma, but you can substitute with usukuchi shoyu or regular soy sauce, too. This hearty stew is so nourishing and tasty. The only seasoning is basically Liquid Shio-Koji, and this magical seasoning makes the chicken extra tender. With the addition of kabocha and Mochi Mugi barley, this dish tastes so complete and makes an ideal one pot meal. My body always feels so great after eating a big bowl of this stew. For this dish, I like making dashi (soup stock) with kombu and dried shiitake by soaking them in water for a few hours (to over night) in advance. They not only make the soup taste wonderful but also they can be sliced and added to cook in the stew to enjoy. But, you can also make this dish with chicken stock or vegetable stock and it will be delicious, too. This is an easy cold-steep vegan dashi (Japanese stock). 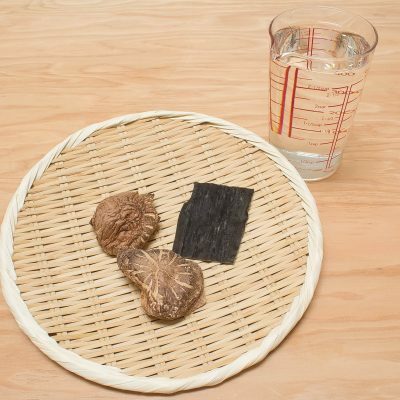 All you need to do is just combine the kombu (dry kelp) and dry shiitake mushrooms in a bowl and pour water. After infusing overnight, the rich vegan dashi is ready. Sato-imo (Japanese taro) is one of my favorite ingredients in the fall to winter seasons. When it’s simmered in broth, it becomes creamy inside and flavor becomes rich. This goes well with konnyaku (yam jelly) and makes such a hearty healthy treat. 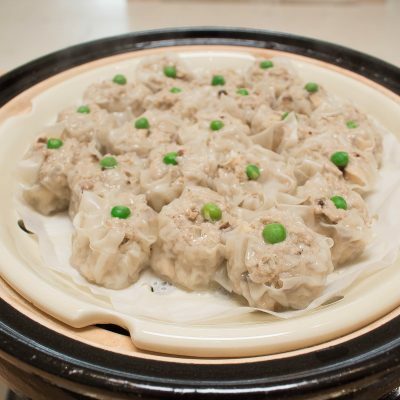 I used ball shape konnyaku in this recipe, but you can just get a block of konnyaku and tear into bite-size pieces by hand, so they will absorb the flavors from the broth well. This dish tastes delicious right when it’s ready, but I like it even more after a few hours of resting. If you let it rest for a few hours or longer. You can reheat it or serve at room temperature. Spring is the high season for freshly foraged bamboo shoots and they taste really wonderful. They are crisp tender and full of sweet spring flavors. In Japan, people enjoy so many different kinds of bamboo dishes while the fresh shoots are in season. Bamboo shoot rice used to be my favorite bamboo dish my mom made when I was a child. This dish also tastes great at room temperature or even cold. If fresh bamboo shoots are not available, pre-cooked bamboo shoot can be found at Japanese grocery stores and they are sold all year round. 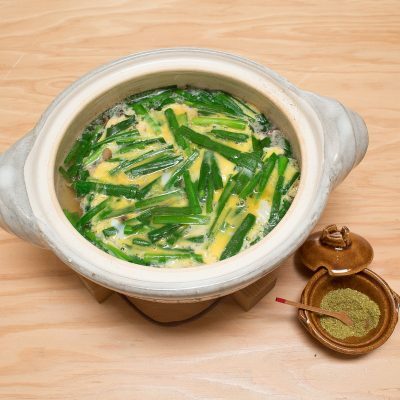 Nira (garlic chives) and shiitake mushrooms are quickly simmered in kombu & shiitake dashi-based broth, then finished with eggs. I like the very soft and slightly runny stage of the eggs, so let it cook for a short time once the eggs are added. This dish is great as an appetizer (served as a soup), side dish, or I also like to pour over rice. If you can’t find nira, you can substitute it with spinach or pea shoot. 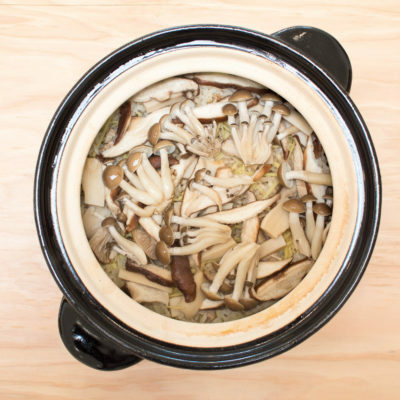 You can also add rehydrated dry shiitake used to make the dashi for extra flavor and texture.